How can the idea of an integrated language curriculum be defined? What are the key principles of language learning and development which should underpin a language curriculum for children aged 3 to 12 years? Where is the evidence for it in policy and practice? What are the expected outcomes by 8 years of age for children’s learning and development in the different language learning contexts described in the background to this research? What kinds of structures are implied in an integrated curriculum for children’s language learning from 3 to 12 years, and how would these structures accommodate the different language learning contexts described in the background to the research? Some practical examples of language curriculum integration are also attached in Appendix, which are from Alberta, Canada, Scotland, and Wales etc. Remembering the International Mother Language Day is a good excuse to also celebrate the two years existence of the MLE and India Web Blog. You have been of great support to make that site work well. Most Popular Post of last year: "Linguistic imperialism alive and kicking"
Viewed from India (1800) ,US (1900), Ukraine (600), Russia (500), China (400), UK (400), etc. M TALL involves all major language group experts, related NGOs, media, 5 government departments, teachers and children. Recently a team of DIET from Chhattisgarh appreciate these model and expressed to replicate this in their state as well. Binay Pattanayak, an UNICEF education specialist is behind all these activities. Unesco Bangkok send out the below announcement. It looks like an exciting conference again. There is lots that can be shared from India so we hope many can attend. 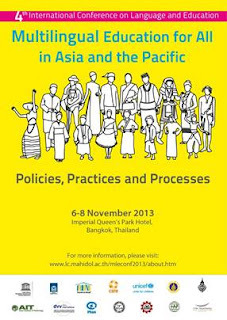 Asia MLE WG is organizing 4th International Conference on Language Education – Multilingual Education for ALL in Asia Pacific: Policies, practices and processes on 6-8 November 2013 in Bangkok, Thailand. The conference brings together MLE partners to increase understanding of the importance of expanding access to effective MLE and strengthen momentum for MLE in Asia and the Pacific region. The conference will facilitate the exchange of effective practices and experiences, link MLE theory to practice and foster policy dialogue. 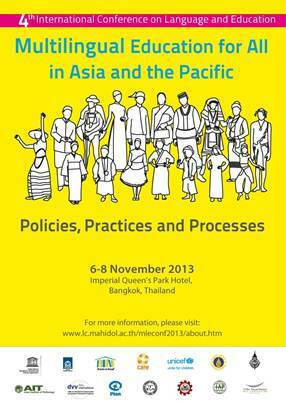 The conference will serve as a platform for forward-looking debate and the shaping of effective education policies and programmes for the post-2015 agenda.